This comfortable, semi-detached cottage, attached to the owner's home, sits in a rural position on the edge of Yoxall in Staffordshire, sleeping two people in one bedroom. 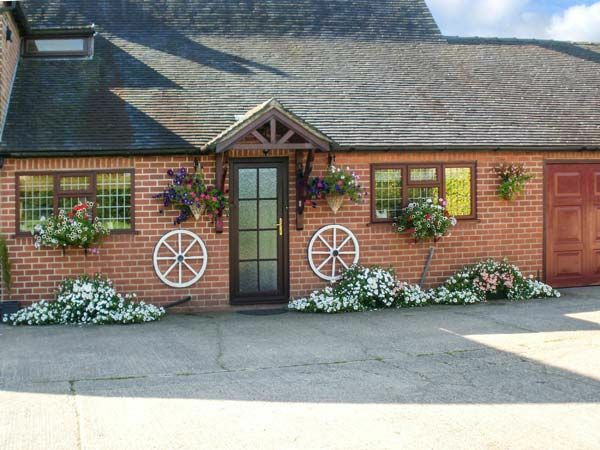 Westwing is a comfortable, semi-detached cottage set on the owner's farming land, one mile from the village of Yoxall in Staffordshire. With one double bedroom with en-suite shower room and walk-in wardrobe, this cottage sleeps two people. There's also a kitchen with breakfast bar, a shared external utility and a sitting room with a gas fire and dining area. Outside is a shared utility room plus off road parking for one car and a shared lawned garden with patio, furniture and pond. Westwing provides couples with a cosy, country hideaway from which to explore the beauty of this rural area. Amenities: Gas central heating with gas fire. Electric oven and hob, microwave, fridge/freezer, washing machine in utility, dishwasher, 2 x TVs with Freeview, DVD, WiFi. Fuel and power inc. in rent. Bed linen and towels inc. in rent. Off road parking for 1 car. Secure bike storage. Shared lawned garden with patio, furniture and pond. Sorry, no pets and no smoking. Shop and pubs 1 mile. Note: Babes-in-arms only. Region: The ultimate in year-round appeal, the Peak District offers countryside, picturesque villages and magnificent scenery. It touches upon six counties and encloses 555 square miles of open moorland, flowing rivers, and wooded dales. Town: Yoxall is a bustling little village set beside the River Swarbourn in the heart of Staffordshire. Settled just nine miles from both Burton upon Trent and Litchfield, Yoxall boasts a wonderful array of amenities including an excellent local butcher, deli, Post Office and two good pubs serving food, and completing this Staffordshire picture village is the pretty parish church. One double bedroom with TV and en-suite shower, basin and WC. Kitchen with breakfast bar. Shared external utility. Sitting room with dining area and gas fire. Gas central heating with gas fire. Electric oven and hob, microwave, fridge/freezer, washing machine in utility, dishwasher, 2 x TVs with Freeview, DVD, WiFi. Fuel and power inc. in rent. Bed linen and towels inc. in rent. Off road parking for 1 car. Secure bike storage. Shared lawned garden with patio, furniture and pond. Sorry, no pets and no smoking. Shop and pubs 1 mile. Note: Babes-in-arms only.